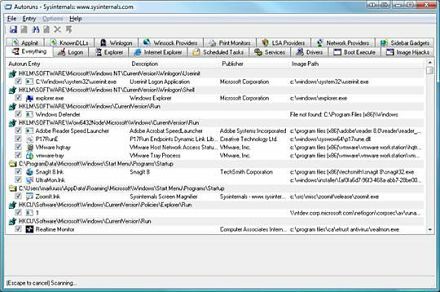 ListDLLs is a free utility that will show you which DLLs are loaded on Windows 9x or NT , including Microsoft Windows 7. ListDLLs is able to show you the full path names of loaded modules – not just their base names. In addition, ListDLLs will flag loaded DLLs that have different version numbers than their corresponding on-disk files (which occurs when the file is updated after a program loads the DLL), and can tell you which DLLs were relocated because they are not loaded at their base address. Just copy ListDLLs onto your executable path, and type “listdlls”. ListDLLs is distributed through Windows Sysinternals, which is in turn a part of Microsoft® TechNet. The software is developed and is intellectual property of Mark Russinovich. This Article Has Been Shared 700 Times! Cite this article as: Abhishek Ghosh, "ListDLLs : a free utility that shows which DLLs are loaded on Windows," in The Customize Windows, March 11, 2011, April 25, 2019, https://thecustomizewindows.com/2011/03/listdlls-a-free-utility-that-shows-which-dlls-are-loaded-on-windows/.